Photographer: Rankin. 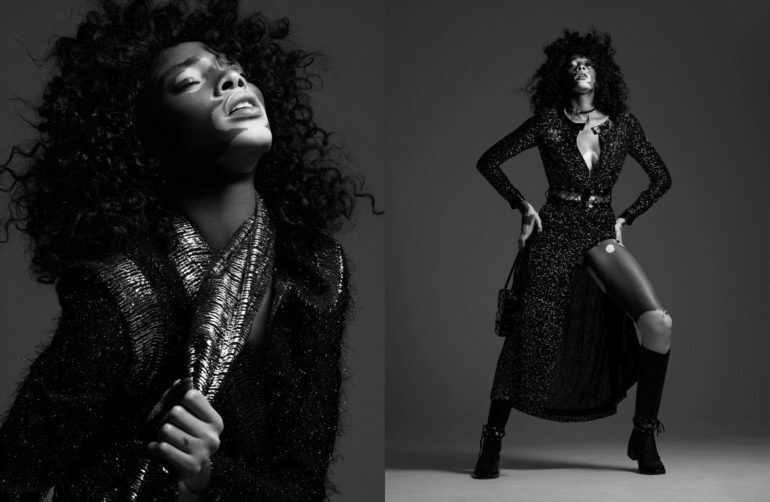 Model(s): Winnie Harlow. 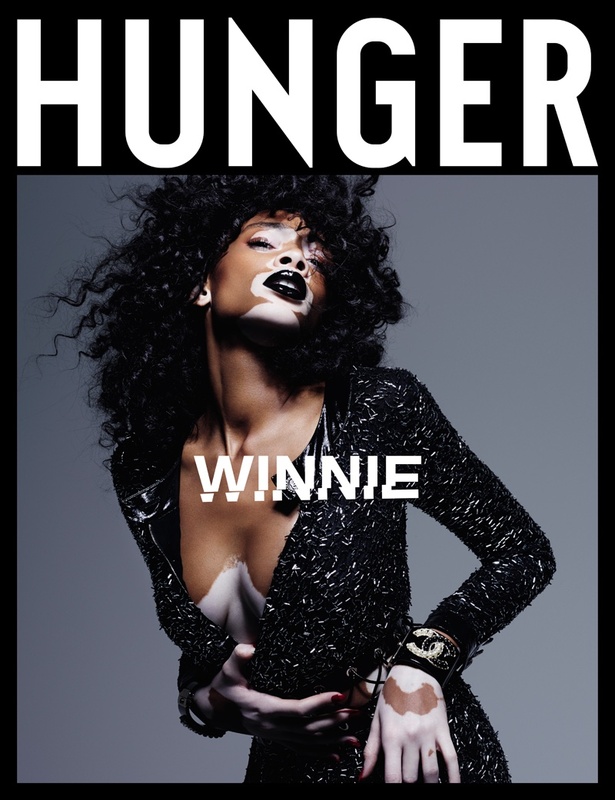 Source: Hunger Magazine. 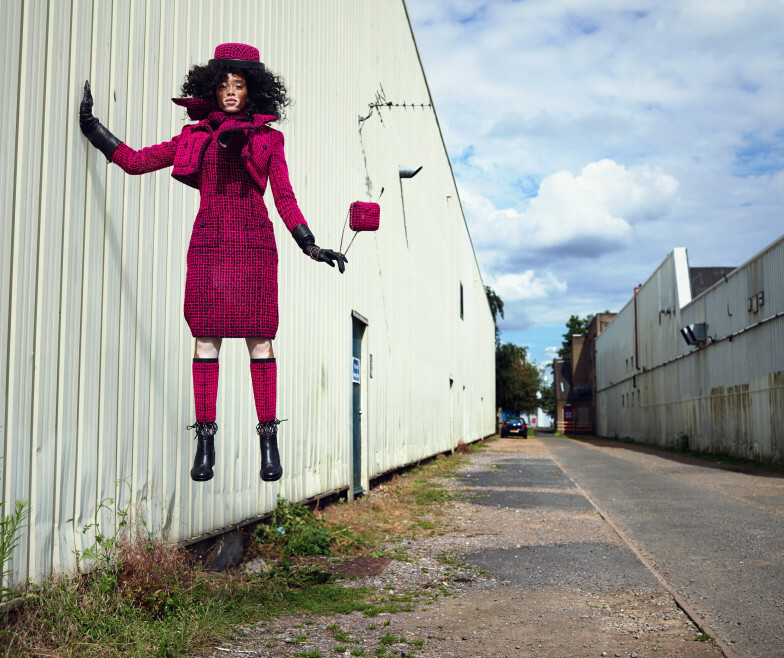 Stylist: Anna Hughes-Chamberlain, Casting Director: Nick Forbes-Watson, Creative Director: Vicky Lawton. Makeup: James O’Riley. Hair: Brady Lea. 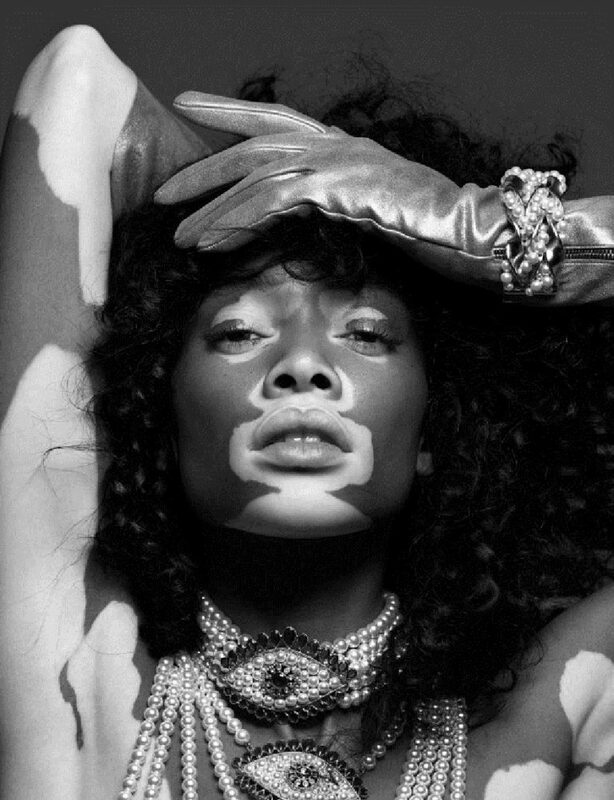 Winnie Harlow strikes while the iron is hot in “Unlocked” issue by Rankin for Hunger Magazine #11. Breaking forth a fusion of hope and heritic, this story centers on the healing of humanity. The Hunger that exists when waiting to see the “She” that’s coming to be. Here, we get a unique view of someone dealing with success, despite their painful circumstances. What holds me down is what ultimately fuels me to rise… This portrayal is an impassioned connection to those things that make us ache, while still honoring our will to survive. Some of our greatest sages say with a hopeful heart, the Hunger of which I speak is the sustenance that I do seek. Anna Hughes-Chamberlain uses a series of textured clothing to capture the essence of the film edits. Vanquished visions are seen through the flooded mind’s eye, as each image she’s stretching to reach. Red rushes forth as scarlet seizes to speak, with colors so searing silence says it all. Floating in mid-air she seems to avoid gravity’s pull, standing as if she is not two feet off the ground. Her wild hair flies through the sky as strings of pearls follow suit. 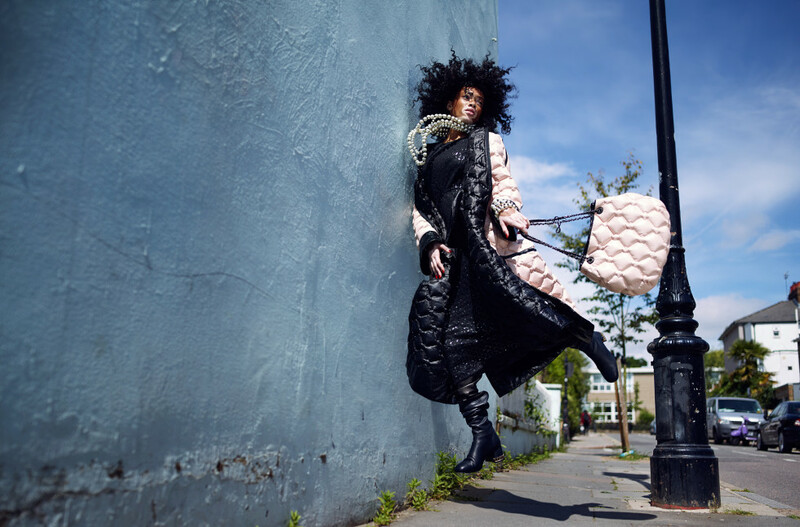 In a long coat of pink with a matching purse, her legs lift up in a fun-flirty gesture, only to realize the floor has fled. Across the way she jumps and plays in a curious outfit done in all white. 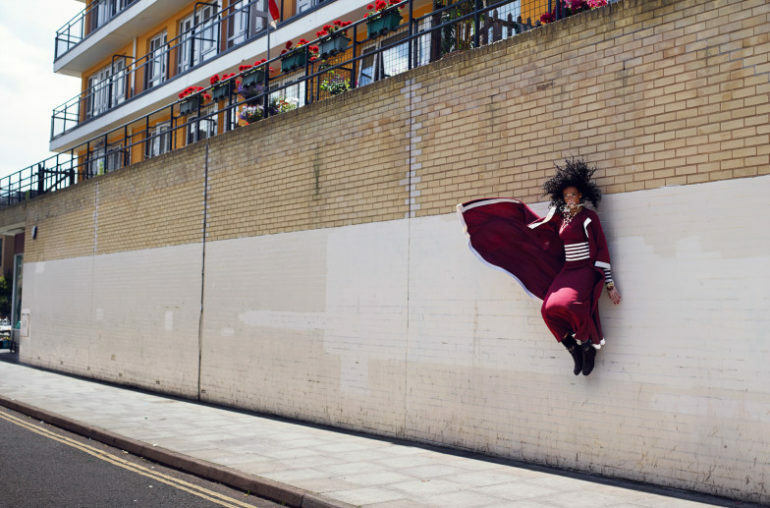 Wearing thigh-high boots she begins to feel the energy, jumping to a staggering new height. A conceptual landscape lures us inside as we get lost in the pathways of the mind. Smooth lines of rich leather are met with an opulent edge, as material looks like liquid metal. Pearlized eyes are referred to as the eyes of the soul. A symbolic depiction of the inner eye sees all things within a cosmic perspective. This represents our ability to see what might be… to see potential. The artistry of skin lets us in as James O’Riley shares with us the beauty of Winnie. What do you use when the palate you are presented with is already naturally gorgeous? And, I say that with the utmost respect. In much of the story he keeps her skin clean, allowing the truth to speak. As he just adds in hints of mascara and subtle tones to highlight. Dressing her lips in a defiant dark shade, he dares us into another dimension. The mouth holds a tremendous amount of power. To pick black to make that statement is a triumph in the craft of cosmetics. Brady Lea embraces her hair with a soft hand, letting nature take its course. Curls cascade and bounce all falling in exquisite form. Harlow doesn’t seek to hide rather she aims to evoke. A penetrating position embraces us with strength. Her face emanates with a kind of hopeful resonance, while still sharing a soulful glance.